Ingredients: One tube refrigerated Pillsbury biscuit dough, 1 bottle of organic pasta sauce, 10 slices part skim mozzarella cheese (for the ghost), sliced ripe olives. Roll or pat biscuits into 2-1/2 in. circles. Place on greased baking sheet or non-stick sheet. Pre-heat oven to 400°. Add pasta sauce on top of biscuits. Bake for 8-10 minutes or until edges are lightly browned. Using a small ghost-shape cookie cutter, cut a ghost out of each cheese slice. Immediately place a ghost over each pizza; add pieces of olives for faces. Pack in his Laptop Lunches after the pizzas have cool down. 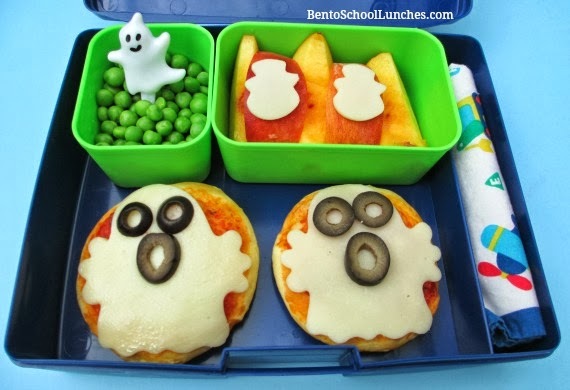 A couple of ghostly pizzas made with Pillsbury biscuit dough, tomato and basil organic pasta sauce topped after removing from oven with mozzarella cheese cut to ghost shape and black olive accents. Top Left - Organic peas with a ghost pick. Top Right - Peach slices topped with mozzarella cheese mini ghosts. Far Right - Fork wrapped in cloth napkin. This is so cute Rina! Love it! Great Idea! Very Good as Snack for a Halloween Party! Loving the ghost pizzas! Great idea! Oh my goodness, these are adorable!! LOVE them! Your ghosties are super cute! OHH! that's how you get the cheese shapes NOT to melt and fill up! LOL - i have been trying to make mini pizza's with cheese shapes, but have been throwing the cheese in the oven with everything else, meaning the cheese melts and fills any designs you may have made! I knew putting the cheese on after they cooled meant it wouldn't stick, but never thought of putting them on right after the over. Thanks!